Add in any nuts, seeds or fruit you would like. If you want a thick mixture, add more nuts and seeds. Alternatively, if you want more moisture in the energy bars, add extra fruit. 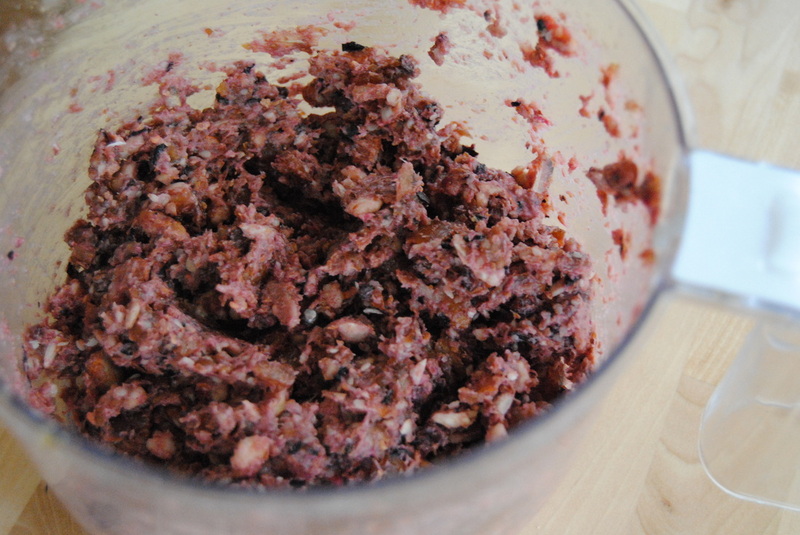 Continue to blend everything together until a thick paste forms. 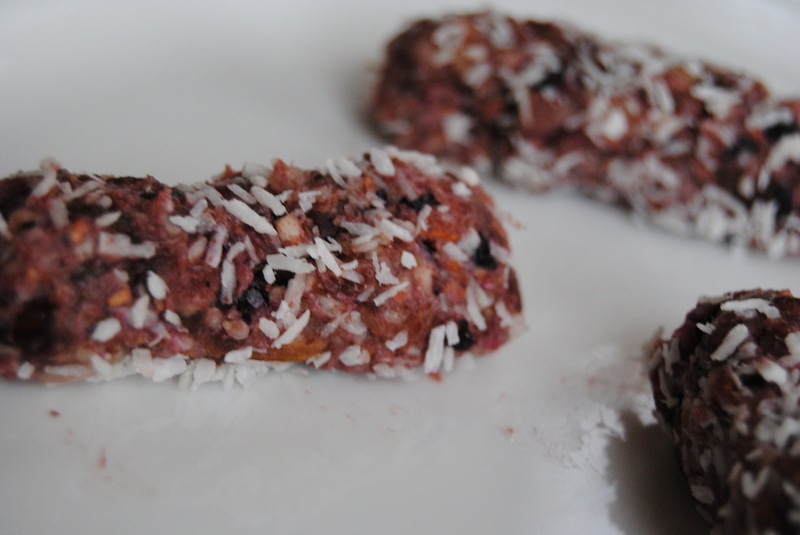 If you would like to taste whole fruit and nut pieces in your bars, blend for a shorter amount of time. For a smoother consistency, keep blending until smooth. Now you can roll them into any shapes you would like. 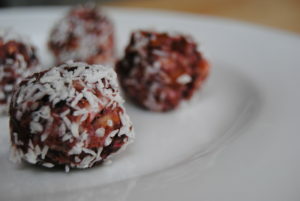 I decided to make energy balls today. 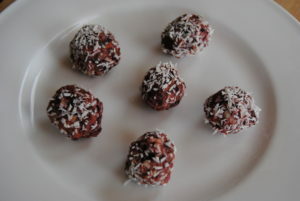 These bite size balls are perfect if you would like a little snack throughout the day. Since they’re raw, they have a high amount of enzymes and will provide lots of energy. They body doesn’t have to work as hard to break these ingredients down. Without any artificial ingredients, this is easier on the liver as well. Most of us aren’t getting enough essential fatty acids. These are fats that the body can’t make on its own so has to rely on getting these fats from the diet. 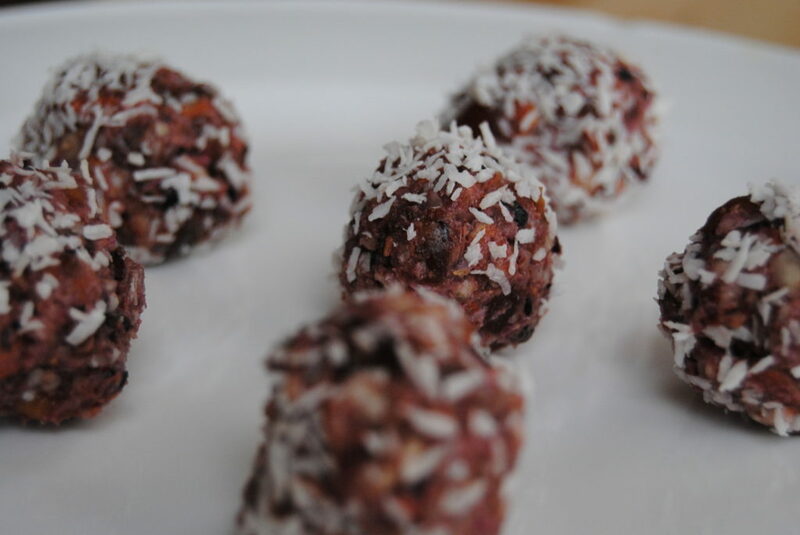 These energy balls are a great way to add healthy fats like flax seeds, walnuts and pumpkin seeds. I also shaped some of the mixture into bars. You can wrap them individually and keep them in the fridge. 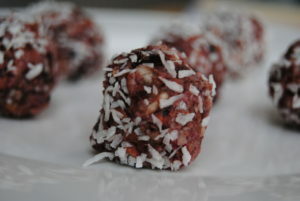 They will form nicely within 30 minutes and you can take them out for your day when you need a healthy pick me up. Mix all of the ingredients together in a food processor then roll them in coconut flakes. If you want them thicker, add more almonds. If you prefer them moist, add more raspberries. Add some of your favourite ingredients into the mix as well. Enjoy!